Giant Hog or a Whole Lotta Bull? 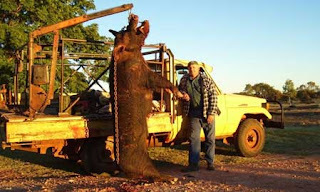 Rumors have been flying around the Lone Star State regarding the shooting of a giant hog near Conroe, Texas. According to the email that has been making the rounds, an 1,800-pound wild boar was shot on the eastern outskirts of Conroe near the Lone Star Executive Airport. Many reports of property destruction due to wild hogs have come in from this area and pigs have been seen crossing high traffic areas for years in this vicinity. I had my doubts about this story from the start. I keep up with the goings on in East Texas pretty well and felt I would have heard something about this giant. It turns out I was right. According to The Courier of Montgomery County the boar was shot and killed in Turkey in 2005. The enormous hog was taken down by a .300-caliber rifle and weighed in at 781 pounds. 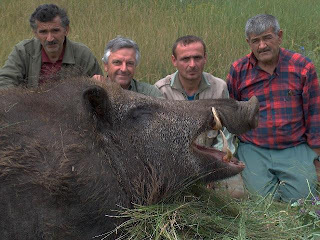 This made it the largest hog ever taken in Turkey. equal of the hog taken in Turkey in 2005. Just last year, according to stories and photos circulating on the internet, an 11 year old boy killed a 1,051 pound hog that measured 9 feet 4 inches long. This claim, to my knowledge, has yet to be verified by Texas Parks & Wildlife officials. Even if the size of that hog turns out to be exaggerated as well, there is little doubt it was one huge pig. 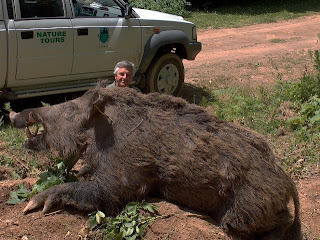 Wild hogs in the South continue to flourish and get bigger. It is true that most hogs in Texas top out at around 300-350 pounds, however, reports continue to come in from hunters and others of hogs that are much bigger. As you can see, I am interested in more than just bigfoot reports. I am intrigued by all the mystery animals that may inhabit Texas. 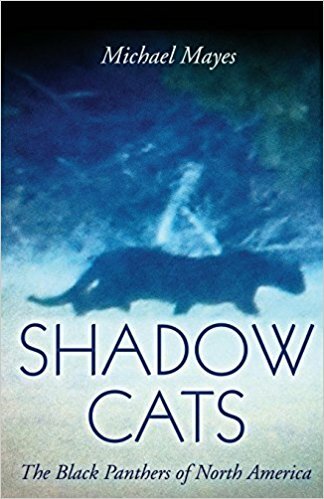 The list of these animals would include the ivory-billed woodpecker, black panthers, jaguars, the chupacabra, giant freshwater catfish, giant alligator gar, and giant hogs. I intend to discuss any and all of these cryptids at one time or another on this blog. Feel free to email me with any photos or stories regarding these, or any other, unusual animals. It seems that a new and surprising discovery regarding the behaviors, intelligence, and ingenuity of the great apes is being made on an astoundingly regular basis of late. This past week scientists revealed a startling discovery regarding chimpanzees. In a study published in the International Journal of Primatology, scientists in the Republic of Congo have reported that wild chimpanzees arm themselves with large crafted clubs made from branches to pound the nests of bees in order to gain access to the honey inside. In addition, these same chimps also put together “toolkits” made up of different sized wooden implements to help in their quest for this sweet treat. You can read the BBC news article, and see some pretty amazing video footage, on this discovery here. Primatologists have long been aware that chimps love honey and will go to great lengths to get at it. Previous studies have noted how these apes fashion and shape sticks to dip into or pry open nests. However, until now, no one knew just how far chimpanzees would go to gain access to this honey. 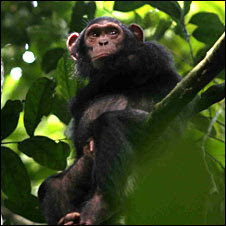 Dr. Crickette Sanz, of the Max Planck Institute of Evolutionary Anthropology in Leipzig, Germany, said, “It seems these chimps in central Africa have developed more sophisticated techniques for getting at the honey than populations in eastern and western Africa – maybe it is some kind of regional feature.” He added, “These nests are tough to get into – they can be at the top of the forest canopy, at the end of a branch – and the chimps will go up there and hang at all sorts of precarious angles to get to the honey, using these clubs in any way that they can to access it.” Video footage, taken over four years of observation by the researchers, shows the chimpanzees poundings these concrete hard nests 1,000 to 1,500 times. Researchers observed some chimps take well over 1,000 swings in the morning, stop and rest several hours, and then return in the afternoon to take another 1,000, or so, swings before finally breaking through and gaining access to the sweet honey. The chimpanzees of the Congo are also using tools of a more subtle type in their bee hive raids. David Morgan, one of the co-authors of the study, from the Wildlife Conservation Society and Chicago’s Lincoln Park Zoo, said, “One of the most exciting aspects is that they are using multiple tools to access the honey that is in these hives. Morgan and the other researchers noted the use of “toolkits” made up of the large pounding clubs, smaller and thinner “dipping wands”, and smaller sticks used for gaining enough leverage to open a hive. Researchers observed the chimps fashioning these tools and then set them aside for later use. “They cache them in the canopy”, said Dr. Morgan. This behavior seems to point to forethought and an understanding, at least on some level, of the future. This very behavior was reported a few weeks ago in a study of a captive chimp, housed in the Furuvik Zoo. The chimp, named Santino, was observed collecting and fashioning throwing sized rocks in the morning, creating a hidden cache of these rocks, and then accessing and throwing them at zoo patrons in the afternoon. Now that such a similar behavior has been observed in wild chimpanzees, it seems to me, the conclusion can be drawn that the great apes do consider the future in a way much more complex than previously thought. There is obviously much more to the great apes than previously suspected. Armed with this new information, sasquatch researchers may want to take a second look at the “wood knocking” phenomenon. To my knowledge, no witness has ever actually seen a sasquatch rapping a large limb against a tree. However, it has become a commonly held belief that, somehow, these wood knocks are connected to the sasquatch mystery. The sounds of wood being pounded on wood in a rhythmic manner in very remote and isolated areas has been reported, and recorded, many times. I have heard these knocks myself while out in the woods of East Texas. The times I’ve heard wood knocks the most clearly have been in the middle of the night in extremely remote areas where it is highly unlikely other humans were present. 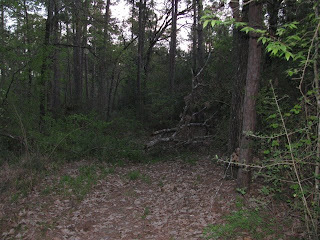 Most of the theories put forth by researchers who believe the sasquatch is behind this wood knocking phenomenon center around it being a means of communication of some kind. Others have hypothesized it is actually an attempt to intimidate and drive off human intruders. Perhaps we can now add a new theory. It is possible, after observing the chimpanzees of the Congo pounding bee hives in search of honey, that the wood knocking heard often in the deep woods of North America is actually some sort of food searching activity. Could sasquatches be pounding on trees in an effort to get to some sort of food source like termites or other insects? Porcupines, bears, and other animals strip bark from trees in searches for food. These animals have the benefit of claws to get rid of the bark and to the insects. 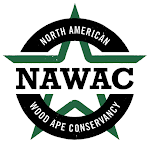 Assuming the sasquatch is at least as intelligent as the known great apes, and has no claws, it isn’t too difficult to imagine one using a crude club to knock the bark off trees and gain access to whatever food stuff might be found inside. Indeed, the more we learn about the great apes and their cognitive abilities, the easier it is to believe that a rare and elusive species such as the sasquatch could exist in the most remote forests of North America and the world. 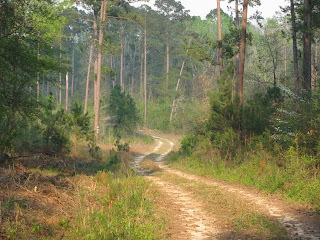 I spent the past weekend hiking and road running in the Sam Houston National Forest deep in East Texas. Unfortunately, I don’t have much to report. I did walk up on large animals twice over the weekend but never was able to get a look at either. The first animal high tailed it when I got within twenty- five yards of it. I’m 99% sure it was a deer. The second time was a little more interesting. The animal was deep in brush only fifteen yards or so from me. It moved as I approached but only a little way. When I moved toward it, it would give the same amount of ground. It kept its distance but never did, that I could hear, move off completely. I played this game for fifteen minutes or so before walking off the trail and into the brush. I never was able to get a glimpse of whatever it was. I did run the roads at night with video camera running. Unfortunately, all I captured were three skunks and one opossum. There were very few animals out at night. Usually, deer are all over the place but I didn’t see even one over the weekend. I am going to attribute this, at least partially, to the fact that it was a spring break weekend and the woods had an unusually large number of campers around. I’m guessing that most of the larger fauna retreated much deeper into the forest and as far away from the human element as possible. It is a theory anyway. Despite the lack of success as far as my main objective, it was a beautiful weekend to be outside. Temperatures were in the high 70s to low 80s and the nighttime lows were in the low 50s. It beat sitting around watching television all weekend for sure. I will be down in SE Texas for a couple of days doing some snooping around (thank goodness for spring break). I will be off-line for a while but will post an update on what, if anything, I come across while out. There is an interesting article on today's Chicago Post-Tribune website about a local podiatrist who was asked by the producers of MonsterQuest to examine castings of alleged sasquatch footprints. Dr. Michael Nirenberg was asked by the producers of the History Channel's hit series to examine various castings taken in different areas and over a period of many years. To my knowledge, Dr. Nirenberg is the first podiatrist to examine plaster castings of alleged sasquatch footprints. You can read the entire article and get more details here. However, his opinion after examining the castings can be summed up in his statement, "I'm led to believe there is some sort of creature out there making these footprints." Give the article a look. Dr. Nirenberg has some interesting things to say. In an article by Malin Rising published today by the Associated Press, and posted on the Yahoo! News website, startling information on the intelligence of a chimpanzee named Santino is documented. The observed behaviors of this particular chimpanzee seem to prove that apes are very much aware of the future and can plan ahead for it just like humans can. You can access the article here. According to a report in the journal Current Biology, Santino collected a stash of rocks during periods of calm, stowed them away until the time was right, and then hurled them at unsuspecting zoo visitors who gawked at him. Santino even went so far as to probe the artificial concrete “boulders” in his enclosure seeking weak spots. 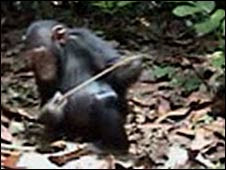 Once located, the chimp knocked off chunks of the material to add to his weapons cache. Even more impressive is that Santino did all of his collecting in the morning hours before the zoo opened and waited until midday before raining down his collection upon zoo patrons. The connection to sasquatch research is fairly obvious. 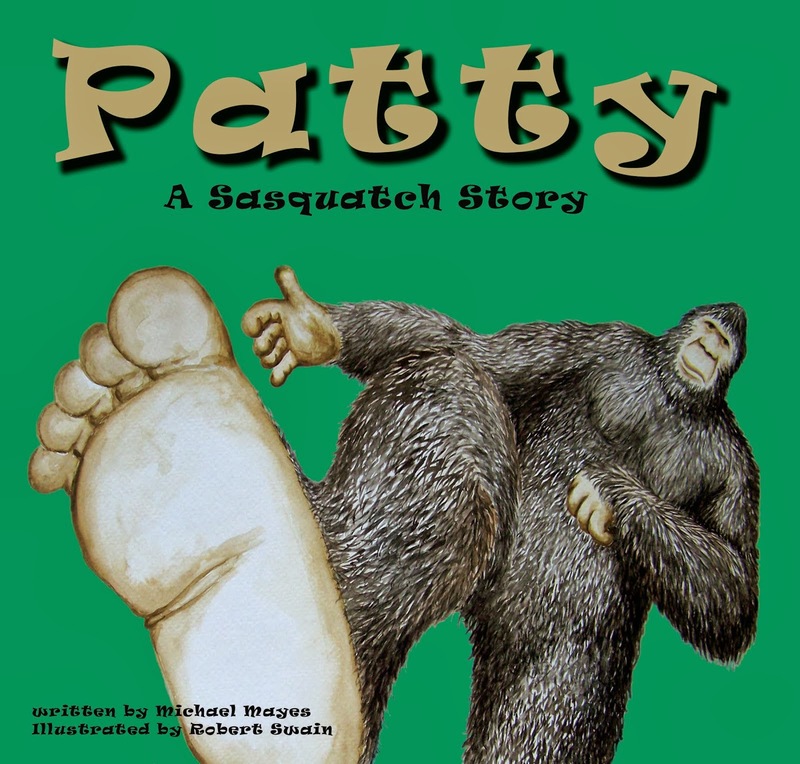 There have been many reports of sasquatches throwing sticks or rocks at witnesses. This is a behavior that was scoffed at once by the scientific community as a whole as being too fantastic to be believable. Now, this exact behavior has been observed many times in several different species of great apes. Suddenly, the accounts of witnesses having rocks rained down upon them, their cabins, tents, or vehicles seem much more plausible. Of even more interest to me, however, is the notion that great apes seem to have an understanding of how possible future events may play out and, therefore, make contingency plans for them. Could it be that hikers, campers, and fishermen who have had rocks rain down on them stumbled too close to the actual nest or breeding area of a sasquatch? Perhaps these types of reports should be examined more closely than a typical, if there is such a thing, sighting report. Based on the behaviors observed in Santino the chimpanzee, it may not be so far fetched to think it possible that a sasquatch might stash rocks or limbs in several locations around it’s true home to be used in the event an intruder wanders just a bit too close. I would contend that researchers might want to zero in on locations where rock or stick throwing incidents have allegedly occurred. These incidents just might shed light on areas that sasquatches feel strongly about. By far the most commonly reported response of sasquatches to human interlopers is simply to walk away. The stick or rock throwing is a very different, and much more aggressive, behavior. What could elicit such a, seemingly, atypical response? Maybe, just maybe, it is that the intruder is too close to the animal’s home, young, or main food source. If true, these are the areas that might need to be monitored closely over long periods of time. After all, a rock or stick bouncing off the old noggin would be a small price to pay for the “discovery of the century”.